.:. 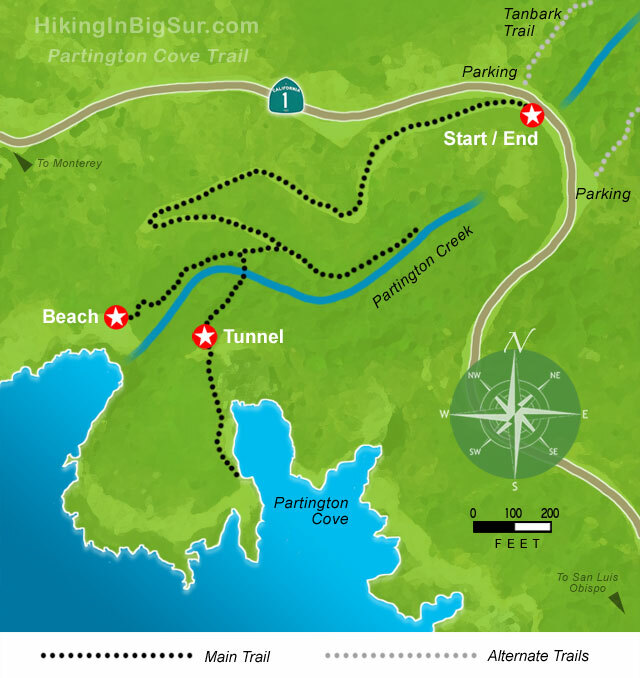 Hiking in Big Sur - Partington Cove Trail .:. After parking, look for the metal gate on the ocean side of Highway 1. You'll proceed down the well maintained but steep access road with views out to the coast. Where the path begins to level out, you'll reach the first junction where, going straight, a short trail heads off to the left past a kiosk. The kiosk provides visitors with information about the sea life just offshore, and you can walk by and back towards the highway into a small wooded canyon. This short spur is picturesque and follows Partington Creek a ways up until the large rocks and plants block further progress. The creek itself emerges from a large culvert that passes under the highway. Walk back to the main path and head left towards the ocean and then take a left at the next junction and go across the wooden bridge. After a short distance, you'll be at the mouth of the tunnel that takes you through the ridge to the cove. As seen in the photo, it's tall enough inside for an average person to walk upright. Starting in the late 1800s, John Partington set up a business harvesting and hauling the bark of the tanbark oak down to ships anchored in the relatively calm and deep waters of the cove. The bark was moved down the canyon and through the tunnel by mules pulling sleds sporting wheels in the front and rails in back. During prohibition, the cove was rumored to be a favorite landing point for smuggling liquor and also served as an equipment drop during the construction of Highway 1. These days, a few bolts in the rocks and timbers are all that remain, along with a nice bench to enjoy the view. After going back through the tunnel to the main trail, take a left and a short path takes you to a small beach covered with medium-size granite boulders. This is the end of the hike and it's time to contemplate the steep walk back up to the highway. There are a couple modest restrooms along this trail near the bottom. While you're here, take a few minutes and cross Highway 1 towards the mountains and look for the start of the Tanbark Trail to the left of the guardrail. A quick hike east will land you in a verdant redwood grove along Partington Creek. Hike in as long as you like, or consider doing the Tanbark Trail loop and visit the tin house if you have the time. The Partington Cove Trail starts at a large pullout in a sweeping bend on the inland side of Highway 1. You can park on either side of the highwayon the west side there is the road down to Partington Cove with a gate at top. The pullout is just 2 miles north of the Julia Pfeiffer Burns State Park turnoff, or 54.6 miles north of the Hearst Castle turnoff. 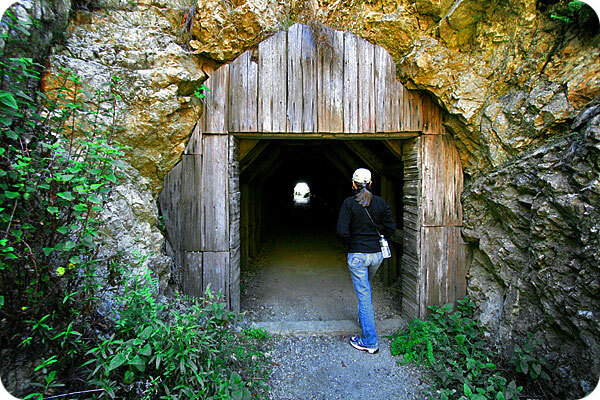 Travelling south on Highway 1, the pullout is 9 miles south of Pfeiffer Big Sur State Park Entrance or exactly 6 miles south of Nepenthe Restaurant.